Today Honeywell makes products for the Aerospace industry as well as Automotive but is probably most widely known for its thermostats. They also manufacture Indoor air quality products as well as humidifiers and dehumidifiers, ventilation systems and more. We carry all models of Honeywell products, most notably the thermostats. 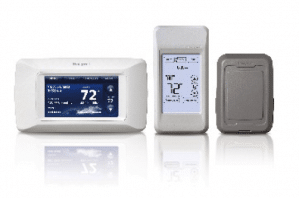 Some of Honeywell’s high end thermostats include features such as full color displays, internet connectivity for remote programming, and a portable comfort control for changing the temperature from anywhere in your home or business. The most common thermostats we install throughout the year include the pro 2000 – pro 8000 series. Something to keep in mind is setting a programmable thermostat properly can save you up to 33% of your energy cost. Click here for more information on the range of Honeywell products we service and install. Call or email us with any questions regarding Honeywell’s full line of Home or business Controls or IAQ products.